PS 26.00 contains benchmarks and evaluation criteria for physical properties, such as mechanical stability, flexibility, and package stability of the liquid coating, as well as performance requirements for corrosion resistance properties that are evaluated using accelerated weathering tests. 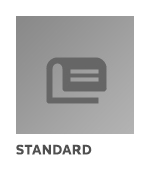 The standard also allows for two Types of coating: Type I coatings are intended for use over hand-cleaned steel; Type II coatings are intended for use over blast-cleaned steel. Criteria for preparation of test panels used for corrosion resistance testing of each Type of coating are included in the standard. Although a minimum aluminum metal content of 6.0% by weight is required in the dry film, and the epoxy resin must constitute at least 60% by weight of total solids content, variations in formulation for the two Types are permitted. The performance evaluation criteria, however, are identical for both Types.